Ahhhh, it’s a wonderful feeling to carry six pounds on your back when you usually carry thirty plus pounds. I’ve been the lucky hiker who has been able to “slack pack” over three hundred miles at the end of my trek thanks to two Trail Angels – my husband, Marc, and Santiago’s wife, Laura. We are a couple days from beginning the 100-mile wilderness, and even in that desolate stretch Laura has found a way to meet up with us every few days so we can light-pack at around twenty-some pounds. Marc started our stretch of slack packing at the end of August, and after he went home a couple weeks later, we found kind shuttle drivers who took some of our stuff up north so we could light pack the days between his visit and Laura arriving. Not only does a light pack make the days lots better – easier footing on steep slippery rocks and less wear on my knees, but it usually means we stay in a hostel, hotel, or off-trail campground that night. Showers, electricity, and restaurants are greatly enjoyed when you’ve been living in the woods for six months! We still camp out a night or two every week, because we hike through such remote areas. Slack packing has made the camping out in between fun again. Even when it’s raining or dips down close to the freezing point, we aren’t too glum because we know in a day or so we will be warm and dry. Friends and followers, we are only about twelve hiking days from finishing our 2,190.9 mile trek! I have been enjoying the journey far more these last weeks than we were in the middle, thanks to Marc and Laura. It’s been tough and challenging, beautiful and humbling, …and ever so much better since our favorite Trail Angels came to help lighten our load. The thru hiker drop out rate tracked by the Appalachian Trail Conservancy (ATC) shows only 20-25% of those who start an AT thru hike go on to finish. 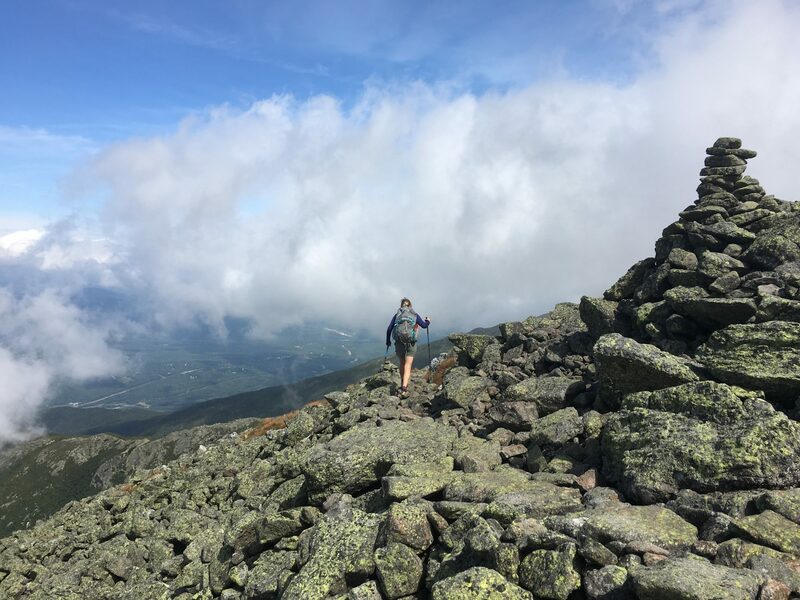 I’ve passed many milestones and plan to summit Mt Katahdin in early October, …and surprised each time someone I’ve met decides to leave the trail for good. Even though it’s taking much longer than I expected, anyone who is near me on trail has plenty of time to finish before Baxter state park closes for winter. Many hikers quit in the first couple weeks and another wave quits before the second month. That was expected. There are so many of us at the start we couldn’t know most of those who quit, but it was clear our numbers were thinning as I moved into the third month. I saw fewer hikers each day at different break and campsite areas. It even started feeling like no one else was on trail, as I would go hours without seeing another northbound thru-hiker. We can literally hike just a half mile apart and not see each other for days. Other times, we catch up with fellow hikers at a rest spot when suddenly everyone chooses the same off trail space or shelter to take a break or camp for the night. Lately though, word is spreading fast when someone quits the trail and it’s catching me by surprise. Somehow, I had it in my head that those who made it past Harper’s Ferry and had their photo taken at the half way check-in at ATC headquarters would be hiking all the way to Maine. As we approached Harper’s Ferry, and spent time there avoiding the rain, I realized a lot of people were leaving the trail for good right after they checked in at the ATC. Many hikers were people I knew that seemed very capable of finishing, but each had something pulling them off-trail. Some were simply tired of doing the same thing every day, particularly when it kept raining all the time. Others cited aches and pains that wouldn’t heal, or running low on funds. A couple hikers seemed just plain homesick after two to three months on trail. It seemed every couple days word came around about who was leaving trail and why. It was unsettling, and I did my best to spend time with people who were working to stick it out. A friend and I hiked out of Harpers Ferry into Maryland and there we ran into two more hikers quitting that very day. It sounded one was determined to leave and the other was leaving because she would no longer have a hiking partner. That is happening a lot: one hiker leaving soon after their hiking partner went home. I was glad Wingman would be rejoining me on trail as soon as he came back from visiting family, as hiking on my own isn’t as appealing as I thought it would be. I had invitations from other hiker friends to join their tramily (trail family) and could go along with them, but I know they hike very differently in pace, distance, and days off from what works for me. I planned to hike near them for a little while though, to keep me connected to the trail life. Wingman rejoined me just a few miles into Maryland and we three went another fifty miles and passed the true half-way marker, where I was sure anyone that reached it would stay on trail unless injured, sick, or bad news from home. I was wrong again. Over 1300 miles into the journey, a hiker talked about leaving and an hour later turned around on the trail and headed back to the last road crossing to catch a lift to the airport. He said it wasn’t fun anymore and he didn’t want to “waste” time doing something he didn’t enjoy. His reason for quitting is actually the one that scares me the most. I don’t want to fall into the trap of giving up just because it’s very unpleasant. Lots of goals require long stretches of physical and mental discomfort and this is definitely one of them. I want to prove to myself I will finish regardless of how much my idea has lost its sparkle. It’s hard to find joy in the trail some days though. Other times I hike along happy as can be for awhile and then find myself weary of it before heading into a neutral zone – all in the course of a couple hours! As the pointy rocks continued to litter our path, the boulders became harder to climb with our packs and poles, and the rain made all of it more treacherous, I realized I needed a good break. We planned to take one after fourteen straight days of hiking, but moved it up a couple days. It was a great idea to move it up, and when Mountain Dew suggested a third day off, we took her up on it. We originally had six hikers planning to take zero days (zero hiking mile day) together, but the rain drive three of them to start a couple days earlier than us. Wiki said if she hadn’t left trail right then for a break, she was about to leave for good. She hasn’t posted since she headed back on trail a couple days ago, but I’m hopeful she is still heading to Maine. Wingman and I are headed to Fort Montgomery, NY and will be in Connecticut in just a few days. Crossing state borders is always a lift of spirits. Then we have a couple other nice milestones before reaching the White Mountains where Marc is going to pick us up and drop us off each day for a week of slackpacking, which means only carrying what you need for the day. Having Marc visit plus slackpacking to look forward to will help us keep our focus on the trail and making decent mileage. The Whites are really tough – and a bit dangerous – so I’m glad to have the extra comfort and support from Marc. In the meantime, I’m still on trail and hoping to hear my remaining thru-hiker friends are still on trail, too! I’m often asked how the trail is marked and if people get lost along the way. The answer to both is yes, although it’s far easier to follow this 2,190 mile trail than you might think. The AT is marked by white blazes for the entire length of the trail, and you find blazes in the woods, scrambling over boulders, walking under an interstate or crossing through a trail town. Other times, the helpful arrows didn’t help me at all. A set on the boulder at the top of a summit confused me into taking the wrong path, which turned out to be neither north or south on the AT. I quickly came to a cliff edge and realized my mistake. Once back at the boulder, I managed to take the southbound path and was heading downhill in the wrong direction when I came across two men I thought looked like the men I met at the last shelter. Sheepishly, I turned back around and followed them back up. They were Kodak and Q, section hikers who I ended up hiking near for a few days and Kodak became a friend. (He met back up with us much later to bring an evening of trail magic to us in Shenandoah!) Unfortunately, once at the top, I picked wrong again and was at the cliff edge. We all went back to the boulder just as Hank Hill strode by and picked a different path. We waited a few beats and followed him. Finally, I was free if the vortex holding me at that summit! The only other time I was lost was when I left my tent late into the night and we were not at a shelter. The camp was bordered by two rivers close by on either side, so I thought I could follow the river back. I didn’t realize one river flowed into the ground and I had stepped over it at that point. I tried three times to find my campsite and could not. Luckily, my headlamp caught the site of our food bags hanging in the trees, so I knew I was close. Finally, I just tried going the opposite of what I thought was correct and voila! my tent reflectors glowed back at me in a few steps. Apparently, the app has rescued many hikers after a midnight potty break. I never leave my tent without my phone anymore. There are blazes marked in other colors, too, primarily blue for water source or shelter paths. Yellow is used to mark other trails, and red blazes or stripes tell you where the National Forest boundaries are so you do not hike into private land. After twelve hundred miles, I have found the trail is often tough to follow, but usually quite easy to find.